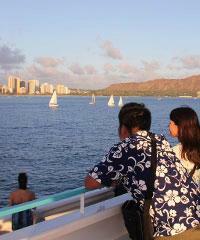 Oahu whale watching tours are another great reason to visit Oahu in the winter months. The whale watching season is usually under way by the 15th of December and usually lasts through April. The very best months are February and March when whale sightings are almost guaranteed. 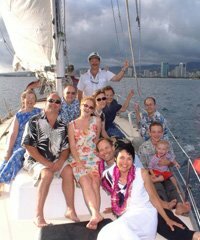 Oahu whale watching tours are a particular delight for visitors coming to Hawaii to escape the winter chill and the Humpback Whales seen on these whale watches can often be seen from the shoreline of Waikiki in addition to the whale watching Honolulu tours. Many of these whale watches are offered at discount pricing. 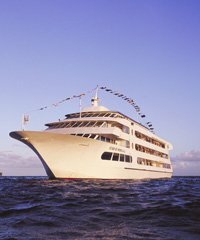 Very large single hull, multi-level 'mega boats' that will take hundreds of visitors out on the same tour. 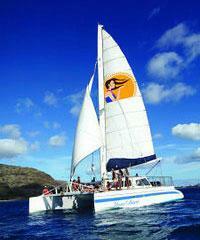 Moderately sized Catamarans that will skim off Oahu's shoreline. Very fast Zodiac or Radon style boats that zip across the waves. Generally speaking, the calmest time of day is in the morning. A case could be made that this might be the best time for a whale watch Honolulu tour because the ocean tends to be calm and seeing the splashes made by the whales is not made difficult by the wind chop on the horizon. The whales however are out there at all times so they will be there to be found at any time of day. Humpback Whales we see on our Oahu whale watches swim to Oahu from Alaska and the shores of Canada, spend the whole winter here, then make the long journey back home leaving Oahu in the spring, usually in April and May. The Humpbacks have a long history of visiting Oahu for the winters and they spend their entire time here mating, baring their young and nursing them until they are large enough and strong enough to make the journey back to Alaska. 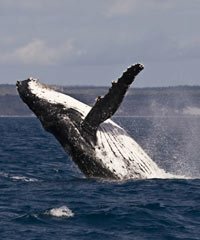 Amazingly, the Humpback Whales don't eat at all during their entire time in Oahu and swim all the way back to Alaska before having another meal. The lungs of an average humpback whale are the size of a small car. Whale babies born on Oahu spend much of their days nursing and grow at a rate of 100 pounds a day and it is a marvelous experience to see them on our Oahu whale watches. In contradistinction, adult Humpback Whales lose weight during this period and actually will have lost a full 25% of their body weight by the time they get home. On your Oahu whale watch, when you see a whale on the surface you are lucky in the sense that they spend the majority of their day diving below the surface. When you see the whales dive below it is called "sounding" and they usually spend between 10 and 45 minutes below before they resurface again. 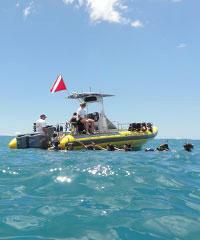 Most Oahu whale watch boats are equipped with hydrophones and you can listen to the whales underwater songs. Remarkably, all male whales will sing the exact same, but very complex, song at the beginning of each whale season and this song will change in the same way for all of them as the season progresses. The next years song will begin where this year's song left off. Scientists are "clueless" as to what why these Humpback Whales sing these songs and no-one really knows what they actually mean. 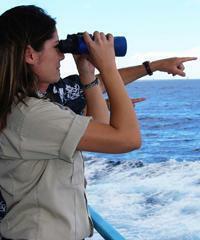 Whale watching happens on all the Hawaiian Islands during the winter months. Oahu is no exception. 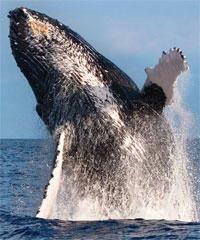 During the winter season, we've got lots and lots of whales happening off the coast of Oahu. The season usually is mid-December through April, something like that, with the peak months being January, February, and March. Whales happen throughout the Hawaiian islands. Probably the island with the most sightings of whales is gonna be Maui, in between Maui and Molokai and Lanai and Kaho'olawe in those channels. That's not to say that there aren't lots of whales happening on all the other islands, including Oahu. You come during the season, you're gonna be able to see whales. We have whales watches that'll take you out to see them. The way this works, what happens is primarily the humpback whales, and they migrate yearly. They come from Alaska and Canada and they make their way down to the Hawaiian Islands and just hang out here. They calve and they mate and they just seem to relax most days, just cruising through in pods and enjoying themselves. There are times when the males get aggressive and skirmish and fight for the female attention, and so on. Most times they're just very, very peaceful and just out there enjoying themselves. What we've got is boats that go out looking for the whales called "whale watches." These are typically about two hours in length. They go out from many locations that we have on the island. You can leave from Waikiki and Honolulu here. We have areas that you can go from Ko Olina and Waianae, also the north shore, and also over here in Kailua. 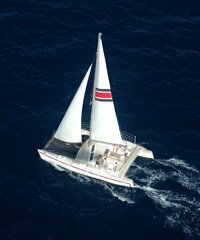 There're many locations that you can be taken off on a number of different vessels. Vessels vary from very large boats, some extremely large, couple decks, maybe. Power-driven vessels. We also have Sailboats and much smaller boats. Zodiac-type power boats, speed boats that cruise along. Each have their own advantages. Some people prefer the stability of a large boat. Also, what's nice about the larger boats is you usually have some height so you can see whales in the distance very easily. The smaller boats are usually faster, more maneuverable, they can get out to the whales quicker. Essentially what they're doing is when you leave from whatever port you're leaving from, you're looking for whales. "Okay, everybody, let's find the whales. Where are they?" Everybody looks. When you see whales, then you cruise over to them. That's where the swiftness of a vessel comes in. The quicker you can get there, the more time you're gonna have with whales. You're not allowed to pull right up next to them. That's not allowable. You have to keep a distance. From that distance you're able to see them and observe them. Usually kill the engines or keep them going really, really low, and just watch, observe, the whales cruising along and doing whatever they do. If we're lucky enough, you get to see whales like that first picture where they breach and they just go up super heights out of the water and come crashing down. You see big splashes of white water in the distance, you know they're out there. A lot of times, they're just cruising by. One of the curious things about the whale watching is it's luck of the draw. We're not allowed to take the boats and go up close to them. We don't wanna interfere with them. A lot of the time, they're curious about the boats and people and they wanna play with the boats a little bit. They'll come over. 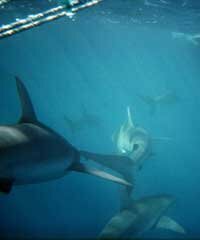 It is not unheard of at all, it happens all the time, where they just come right up to the boat. Sometimes go under the boat and cruise. They can be very exciting, but you never know exactly how that's gonna work out or what it's.. This is an activity that also you should be aware. Whales are out there. If you're on a Dinner Cruise, you're likely to see whales. If you're just doing a Snorkel Trip somewhere during whale season, you're gonna be seeing them. These particular cruises that we're talking about are whale watches. The specific purpose of these whale watches is to actually get out to see the whales, to get close to them and watch and observe them. They're, as I mentioned, just a couple hours and they happen throughout the day. You're not using an entire day to get out on the water and to do this great activity. It's something you should consider doing. I like to recommend going in the mornings. Whales are out there. They're gonna be out there regardless what time you're out there. In the morningtime, it's generally the calmest time of day, which makes it easier to actually spot them. If you got whitecaps going on, it's hard to differentiate between the whitecaps and the breaches, sometimes, or just where they just break the water, do their flapping their flippers and all that. It's a better time to go, earlier the better is what I would recommend. In any event, if you're here during whale season, consider doing a whale watch. 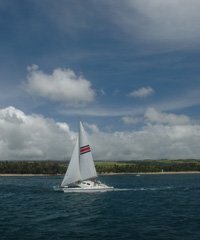 They're inexpensive in terms of other ways that we have to get out on the water, so it's a really good value. 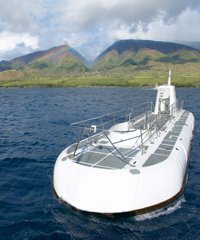 Whale watching on Oahu is a good one and you should plan on doing it.